AUTUMN BREW REVIEW WEEK IS HERE! And that means lots and lots of beer leading up to Saturday's festival. 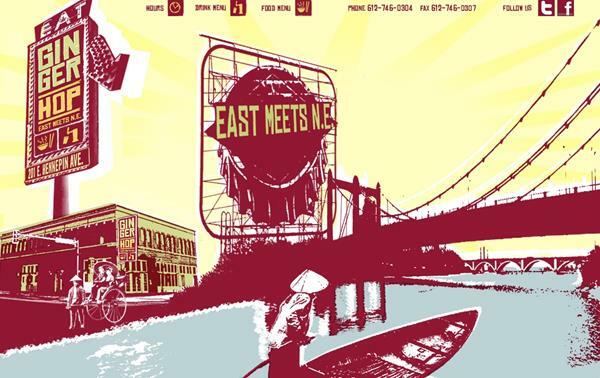 Whether or not you're attending ABR, great beer abounds this week. We'll be out and about tapping special casks and limited release beers across the metro area. Also, our neighbors over at Cuzzy's will be serving up Sweet Child of Vine dirty pork stew and Lonely Blonde-battered walleye all week long. So stop in for lunch or dinner, and have a darn fine brew with a darn good meal. The Bulldog NE will be tapping a cask of the Libertine, our Imperial Red Ale, and one of only a few that will be available this year. This Imperial Red Ale is so good cask-conditioned, we almost wish we could put all of it in firkins. Our friends at Wise Acre Eatery have put together a special three course dinner, paired with Lonely Blonde, Sweet Child of Vine, and War & Peace. 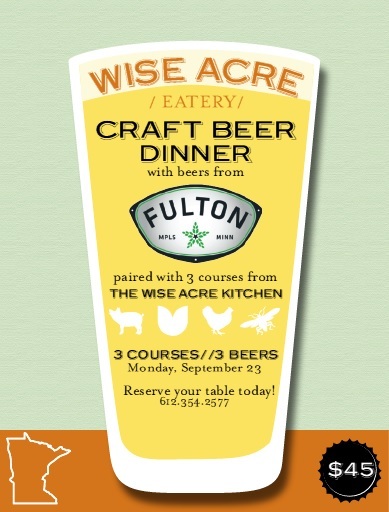 If you've never been to Wise Acre, tonight would be a great time to make your first visit. Wise Acre is run by the same great people behind Tangletown Gardens. Beth, the head chef, is a master of her craft, and at any given time, 80-90% of the ingredients in her kitchen are sourced from their farm just an hour west of here. Call right away to make your reservations - seats are filling up fast as this three course dinner is a steal at $45! 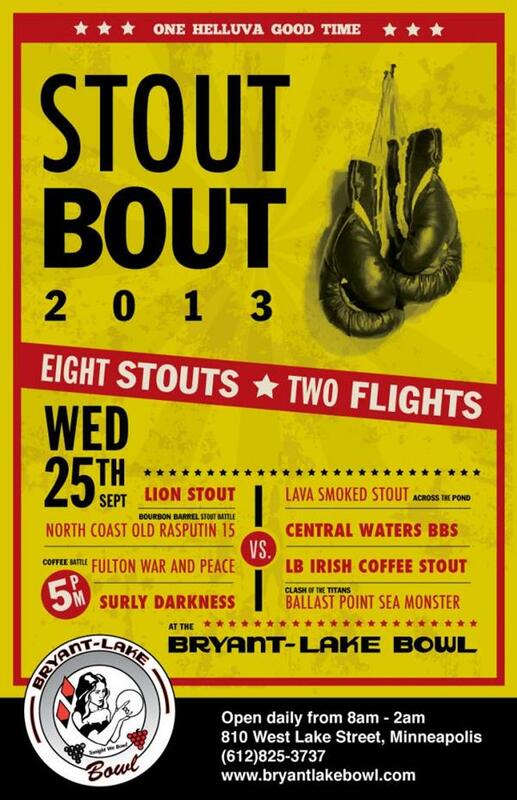 Eight stouts battle it out at Bryant Lake Bowl! Wednesday's card will feature four specific battles: Coffee Battle, Bourbon Barrel Battle, Across the Pond Battle, and Clash of the Titans. The matchup pits two flights of four pours each; both flights will be available at $15 each. Our own War & Peace joins a formidable fracas that includes North Coast's Old Rasputin, Liftbridge's Irish Coffee Stout, Central Waters' Bourbon Barrel Stout, and Surly's Darkness. The throwdown starts at 5:00. It's tough to call the outcome in advance, but one thing is certain: with all of the heavyweights in this fight, the last one standing won't be you. 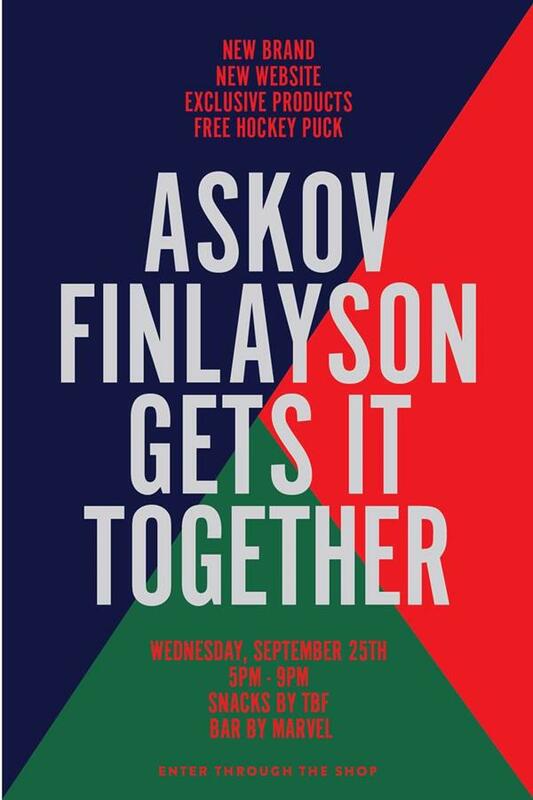 Askov Finlayson - the cool men's store next door to the Bachelor Farmer and just blocks away from our brewery - is throwing a party to launch a new clothing brand and a new website for the store. To celebrate, there will be tasty snacks from the Bachelor Farmer, a bar from Marvel Bar, and a special beer from the Fulton Brewers' Series created just for this event by two of our brewers, Mike Salo and Matt Moon. We're tapping a single keg of an 'American Sahti' (our twist on a traditional Finnish Sahti style) called the Sisu Sahti, which rings in at a very sessionable 5.3%. This is the only keg we brewed of the Sisu Sahti, so if you don't stop out, well, you get the idea. Ginger Hop in NE Minneapolis will be pouring $6 flights to help you along in your quest to acheive beervana. (We're assuming you are, in fact, on a quest of this nature). These three-beer flights will be featuring Bell's Hopsolution, Lagunitas Censored, and our very own Libertine Imperial Red Ale. Stop by for the beer, stay for the food. And maybe some more beer. 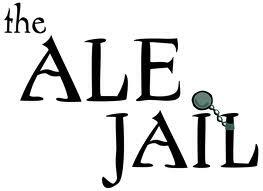 The Ale Jail's annual anniversary party is here, and that means from 4-7 on Friday, you can stop by the store and sample some great beers (and some wine) in their back parking lot. The event is free of charge, and a ton of fun. 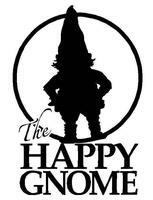 The Happy Gnome will be helping all of us ring in the new season and the crisp cool weather that comes with it by tapping The Libertine and War & Peace! Both beers will start flowing at 5:00. Two great beers, one great bar (and rumor has it, lots of great whiskey, if it gets to that point). Happy Friday! We're building another Minneapolis brewery. And this time, we won't outgrow it in 3 years. This week in 2010, we began building our dream brewery in Minneapolis. Three years later, we’re doing it again. The day we first stepped into the 6,000 square foot North Loop building that would become our first brewery, the first packaging brewery in downtown Minneapolis, and the city's first taproom, it looked cavernous. We even thought we might have to sublease some of the space just to fill it up. It felt like -- and it was -- a huge step from our 2-car garage in the Fulton neighborhood. But things have a way of happening faster than we expect. We started out with 4 fermenters and a brite tank. Then we added a taproom. A few months later, we brought in three more tanks. Six months later, three more again. Three months later, two bigger ones. And just like that, we ran out of space. As we've heard many people say, "it's a good problem to have." True. But still a problem. Here's how we're solving it: in late 2014, we will begin brewing at a new 51,000 square foot production brewery in Northeast Minneapolis. Located in an existing building at 2540 2nd St NE, the new brewery will feature an 80 barrel brewhouse, high-speed bottling and kegging lines, and an initial capacity of 20,000 barrels of annual production, with the ability to expand substantially in the future. The added capacity will allow us to expand distribution beyond the Twin Cities, and to begin adding to our lineup of seasonal and limited production “Garage Series” beers. More Insurrection, anyone? The Ringer in bottles? Another barrel-aged Libertine? Yes, yes, and yes. After the new brewery is commissioned, we will begin brewing 100% of our distributed beer at the new location. Of course, we'll continue to brew small batches at our current brewery for the taproom. Due to Minnesota law, which limits breweries to one taproom per company, the new brewery will not have a taproom. We'll have many more details to share on our new project over the coming months. In the interim, it'll be business as usual at our downtown brewery & taproom. As always, your support and enthusiasm for our beer is what keeps us going, and we appreciate it now more than ever.